On the palate: Sweet and hot, rock candy, spearmint sharpening into peppermint. Finish: Starlight mints, peppermint heat with a sweet sugary background. 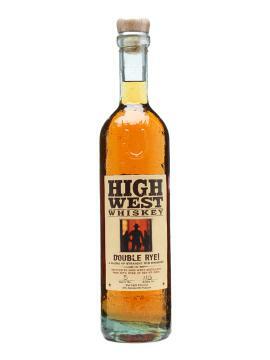 Parting words: This is the first High West rye I’ve reviewed. It tastes like a marriage of Bulleit and Fleischmann’s ryes and there’s a very good reason for that. That’s basically what it is. There’s been some confusion online as to whether the two year old rye in this is from LDI or High West’s own product. Judging by my taste buds, I would say that it’s definitely LDI, at least in this bottle. The resemblance to Bulleit rye is striking, but the undertones bear a strong resemblance to the Fleischmann’s. I expected more oak, given the venerable age of the Barton rye, but it is completely absent. The young rye is so pungent that it almost overwhelms the older stuff, but old manages to keep the it in its place, barely. For sipping, it works well, and works well in cocktails, though the older component is completely overwhelmed in Manhattans and Sazeracs. This is a good rye overall at a not unreasonable price. The bottle is also hand-blown (or at least looks like it) and beautiful, although the campy hangtags are a bit much. High West Double Rye! gets a recommendation.